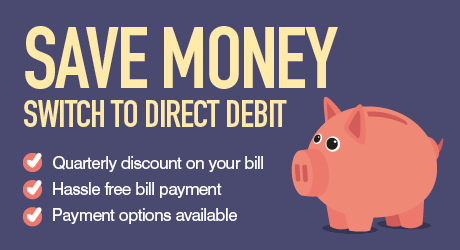 You can set up to pay your water bill by direct debit online and you will receive a £1 reduction per bill for choosing to pay this way, and to make life even easier ask us to email your quarterly bills to you. Spread the cost of your water bill over 12 months, this is the easiest way to pay your water bill with 12 equal monthly payments. You can choose the date that you want to make the payments, we will calculate your monthly payment amount based on your metered consumption history or on the number of people living in your property, if you have recently moved in. All metered customer bills are reviewed annually from when they are set up and adjusted according to your usage. If you are charged for water by Domestic Assessed Volume Tariff your monthly instalments will change on 1 April each year. We will not makes changes to the amounts that you pay via your Direct Debit instruction without informing you first. You can set up a Direct Debit online, you can call us or you can complete a Direct Debit form and post it to us. To set up online simply complete the online Direct Debit Instruction, if you have chosen to pay monthly we will send your budget plan detailing your monthly payments, budget plans are reviewed annually. Telephone set-up, call us on 707301 during working hours with your Jersey Water Account number and your bank account information. We will take your details as required and set up the Direct Debit, confirmation will be sent to you by post. If your bank account requires more than one signature to authorise debits on the account you will need to complete a Direct Debit Instruction form and return it to the Customer Services Department with the required authorised signatures. We will inform you in advance of any changes to your payments and will send you your bill each quarter with the payment amounts detailed on it. You can stop paying by Direct Debit at any time. Simply inform the Customer Services Department and your bank or building society. If you have any further questions about Direct Debit payments please contact the Customer Services Department. If there are any changes to the amount, date or frequency of your Direct Debit Jersey Water will notify you 10 working days in advance of your account being debited or as otherwise agreed. If you request Jersey Water to collect a payment, confirmation of the amount and date will be given to you at the time of the request. If an error is made in the payment of your Direct Debit by Jersey Water or your bank or building society you are entitled to a full and immediate refund of the amount paid from your bank or building society – If you receive a refund you are not entitled to, you must pay it back when Jersey Water asks you to. You can cancel a Direct Debit at any time by simply contacting your bank or building society. Written confirmation may be required, please also inform the Customer Services Department.